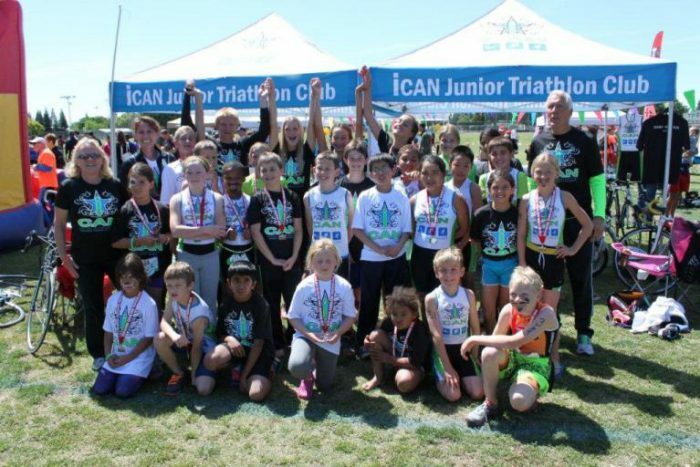 iCAN Junior Triathlon Team is composed of athletes of all sizes, ages, and skill level. Some participants may be experienced youth and junior triathletes while some are participating in sport of triathlon for the first time. We create a safe, fun, and encouraging team environment, in which athletes develop the skills to enjoy the sport of triathlon. Triathletes train to their age appropriate developmental stage, current conditioning, experience, and skill level, to accomplish their individual goals. Triathletes have the option to compete in any of the scheduled races for each Session and enter other races that they choose or as their coach recommends. $395.00 per athlete (30 training’s, 5.5 hours weekly for 10 weeks). Cost doesn’t include race entry fees and travel. For flexible training you can purchase a Triathlon Training Card for $200.00. This gives you 10 training’s. The triathlon training card may be used for Session I and II of the current calendar year only. Daily training is available for $25.00 per training. Proficient in the freestyle swim stroke, have a bike in good operating condition, approved bike helmet and a good pair of running shoes. In this group of entry level athletes, the inherent emphasis is on safety, fun, and skill development. Athletes develop the correct skills for swimming, biking, and running through sport specific, skill development training. Athletes at all levels of development should enjoy their training and racing experience. This is accomplished through a variety of skills based training’s, positive experiences, and positive social interaction with coaches and fellow triathletes. This goal oriented group of triathletes usually has several years of training and racing experience. While still in a developmental stage, these triathletes are mastering swim, bike, and run techniques, building base, and speed to advance in future years. These athletes have usually chosen the sport of triathlon as a primary sport and want to further develop their skills, knowledge, training, and performance with a goal to perform at the Junior Elite level. These triathletes are generally on an Individual Training Plans (ITP). This higher and usually more experienced level of goal oriented triathletes has usually developed from the Youth Elite and has been training and racing for a number of years. They are furthering their mastery of swim, bike, and run techniques and are training specifically for future opportunities within the highly competitive ranks of national and international competition. Regional and national development opportunities are available to help hone the skills of this more elite competitor. These triathletes are on Individual Training Plans (ITP). A HPT is organized around the purpose of identifying, recruiting, and developing elite level talent. These individuals come from the ranks of the Junior Elite and are provided with opportunity to continue training and competing with their home team. In this manner, younger triathletes are exposed to their training commitment and performance standards on a regular basis. These individual team members work very closely with their coach and his sports performance staff to move strategically through the USA Triathlon developmental pipeline. Race distances may vary based on the race directors discretion and the race.